With all due respect, MR President, no amount of your oft-vaunted ‘soaring oratory’ skills is clouding the truth in the disgrace which is Bowe Bergdahl and your patently futile efforts – aided and abetted by the msm as usual – to paint Bowe Bergdahl as a hero..
All well and good, and if Bergdahl was my son I, too, would no doubt be relieved to know my missing Soldier was safe in the US Military custody rather than ‘suffering’ at the hands of terrorists. However – and let me be perfectly clear: From everything I have heard over the years, and everything I am now reading, Bergdahl is NO innocent hero, but is in fact by his own words, his own actions, his own CHOICES, a big fat ZERO. Plainly speaking: Bergdahl’s actions, choices, have cost the lives of more than a few honorable American Soldiers. Over the last 48 hours, everybody and anybody has expressed an opinion on the current media darling that Bergdahl and his family is being presented as. I know I am not the only one who is sickened by Bob Bergdahl (Zero’s dad) hogging the media spotlight as he tells us that his son will take a while to ‘decompress’ from his ordeal, and how proud he is of Bowe. Ooops! That was posted in the hours before the media frenzy following the release of Bergdahl to our Special Forces. 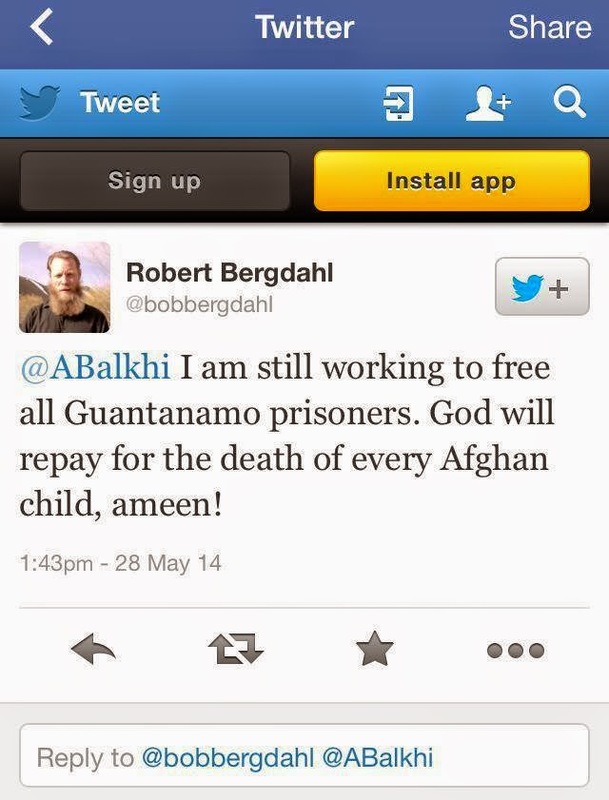 Despite it apparently being deleted, the internet is forever, and offers insights into Bergdahl senior’s true agenda. Question for Bergdahl senior: WHO should pay for every American child, son, father, husband, brother, who gave their lives as they followed orders to search for your DUSTWUN son? I have not heard you mention one word about THEIR sacrifice, you ungrateful cretin. Your president also made no reference to our Fallen Heroes – some of whom are in the picture at the top of this post. “No man left behind” Mr President?????? What about the families whose lives were changed forever, as their Soldiers left their lives on the battlefield of Afghanistan – lives lost as a direct result of Bowe Bergdahl’s actions/choices? THEY have the rest of their lives to ‘decompress.’ Over the last hours, I have been listening to Gold Star Families whose loved ones are represented above. Their Sacrifice has not been acknowledged by either the MIC or the msm. But they are much-loved and missed husbands, fathers, sons, brothers, uncles. Somehow I missed the msm wall to wall coverage of THEIR suffering. Victory Girls has brief bios on them, and I urge you to take a few minutes and remind yourselves of the many lives impacted by the Bergdahls’ actions and statements. Bowe Bergdahl: Truth, Justice and the Men Who Died For Him. “Truth“????? My long time readers know full well that I always give great credibility to our boots on the ground and this situation is no exception. Despite MIC’s efforts, and the msm determination to craft this *story* to further their own agenda, after five years of silence, the dam has broken wide open and Troops who were there are now telling their truth of what really happened as Bergdahl decided to go walkabout. The facts they are sharing are very different from the narrative coming out of the White House and promoted by Hagel and the usual mouthpieces of this administration. Within an hour of the announcement that Sgt. Bowe Bergdahl was handed over to U.S.special forces by the Taliban Saturday evening, Army Times’ Facebook page lit up with hundreds of comments reacting to the news. Most centered on the circumstances surrounding Bergdahl’s capture, which remain something of a mystery. There has been some speculation that he willingly walked away from his unit, raising the question of whether he could be charged with being absent without leave (AWOL) or desertion. Since Bergdahl was “captured” or whatever happened, I took the position that we should all shut up about the speculation of the circumstances involving his capture. I heard rumors early in the news of his capture, but I always figured that if he had value to whoever who was holding him, he’d be kept alive — and no matter what he did, he probably didn’t deserve to be beheaded for it. But, that’s all changed now that he’s in US hands and no longer in danger. I’ve been reading all of the reports on the internet from folks who claimed to serve with Bergdahl and I’ve read the lists of names of troops who lost their lives searching for him…. Jonn Lilyea is well-known for his even-handed approach to all matters Military, and his commenters (the majority of whom are also Military like Lilyea) can be depended on to add their informed two cents’ worth. TAH coverage of Bergdahl is no exception, and I suggest you all go read this latest, here. Be SURE to read all the comments. However, for me, there are just too many claims by first hand witnesses – IN the sandbox – to discount their retelling as mere opinion. To my mind there can be no denial of the credibility of Raven-Wolf over at Bouhammer’s site. Bowe Bergdahl is a traitor. He willingly left his post and his fellow soldiers to go on a spiritual stroll in Afghanistan, convert to Islam and ultimately join up with the Taliban…and in so doing cost us the lives of great soldiers who were tasked with finding him…just run the body count of how many died searching for him in 2009. Bergdahl wasn’t captured as the Army and media spin-doctors would want you to believe. He betrayed his country and should pay the price of incarceration at the least and death by hanging at the best. May he burn in Hell. If you read nothing else on the Bergdahl *story* go read this one. “We were at OP Mest, Paktika Province, Afghanistan. It was a small outpost where B Co 1-501st INF (Airbone) ran operations out of, just an Infantry platoon and ANA counterparts there. The place was an Afghan graveyard. Bergdahl had been acting a little strange, telling people he wanted to “walk the earth” and kept a little journal talking about how he was meant for better things. No one thought anything about it. He was a little “out there”. Next morning he’s gone. We search everywhere, and can’t find him. He left his weapon, his kit, and other sensitive items. He only took some water, a compass and a knife. We find some afghan kids shortly after who saw an american walking north asking about where the taliban are. We get hits on our voice intercepter that Taliban has him, and we were close. We come to realize that the kid deserted his post, snuck out of camp and sought out Taliban… to join them. Many others from various units were wounded or killed while actively looking for Bergdahl. Fighting Increased. IEDs and enemy ambushes increased. The Taliban knew that we were looking for him in high numbers and our movements were predictable. Because of Bergdahl, more men were out in danger, and more attacks on friendly camps and positions were conducted while we were out looking for him. His actions impacted the region more than anyone wants to admit. There is also no way to know what he told the Taliban: Our movements, locations, tactics, weak points on vehicles and other things for the enemy to exploit are just a few possibilities. The Government knows full well that he deserted. It looks bad and is a good propaganda piece for the Taliban. They refuse to acknowledge it. Hell they even promoted him to Sergeant which makes me sick. I feel for his family who only want their son/brother back. They don’t know the truth, or refuse to acknowledge it as well. What he did affected his family and his whole town back home, who don’t know the truth. To add insult to such grievous harm as has been inflicted on our Military families by Bergdahl’s own well-planned actions, we are reminded, by his own words, how unworthy he is of such sacrifices. If you must, revisit the Rolling Stone piece from 2009, and it soon becomes evident that Bowe Bergdahl was no confused innocent acting on the spur of the moment. Hell, he shipped his belongings home prior to going on his walkabout and wrote to his father of his disenchantment with not just the Military, but of his utter disdain for the country whose values he had sworn an oath to uphold. Sorry, MR Bergdahl, the internet really IS forever, and your son’s own words convict him in my mind of gross dishonorable conduct. In my view, he has not, will never, “suffer enough” for his selfish actions that have irreversibly impacted so many who deserved better. I might also remind you, MR Bergdahl, that for now, you and your son may be the story du jour, and the current media darling, serving MIC’s agenda, but very soon, you and your son will be relegated to the archive dustbin of history. Long after your son IS convicted in a Military court (and I truly pray that the punishment meted out does fit the crimes of which he IS guilty,) the real Heroes will be honored and remembered forever. A Hero looks out for others. A Zero is only concerned with himself. Zero inflicted this torment on himself and his family. Worse yet his unbecoming conduct of leaving his post and his fellow soldiers behind put them at great risk and many others. A number of good men were killed or suffered life long debilitating injuries looking for Zero and trying to rescue him. As well a lot of sweat and blood equity went in to capturing the five we traded for Zero. I say Zero is not worth, well Zero, much less five bad dudes now out of containment of GITMO…. Zero says he was lagging behind while on patrol and was captured, thus implicating his fellow soldiers in leaving him behind when in fact he left them behind… In times past he would get a firing squad. At least he should get the brig for life…..
As Raven-Wolf says above: May he burn in Hell. And that is truth. Try spinning that, Mr President or Mr Bergdahl.